"Welcome to the official Tele-Zombie website.....Now, you will do as I tell you!! You will read everything on this page and you will go see Tele-Zombie as soon as it is released or comes to a festival near you! And oh yeah, have a nice day and thank you for visiting the Tele-Zombie website!" Since kickstarting his acting career in Tele-Zombie, Louis Graham has made a name for himself in genre films. Check out his filmography on IMDB! July 10, 2010 - LORY APPEARS ON CREEPY KOFY MOVIE TIME! Lory recently received an email from Roger Corman's office saying that he saw the movie and "I liked it." Also, on Dec 19 Lory did an interview with B-Movie.com. Check it out. Dane Andrew & Rascal "The World's Ugliest Dog" are guests on NBC's Last Call with Carson Daly along with other guests that include Donald Trump, Jenny McCarthy, and the band Smash Mouth. The show airs after Conan O' Brian Friday Sept 23 2005. And after Last call, you can get a glimpse of Dane shaking hands with Leno at the start of the Tonight Show. See some pics here. Dane and Rascal's appearance on the Jane Pauley Show will be airing again this Tuesday August 23. Go to janepauley.com for show times. Check out the new interview with Lory-Michael on horror web site Racks & Razors. TELE-ZOMBIE has been selected for the Official Leeds Anime Horror Film Festival, coming up October 30-31. Check out their web site at www.leedsanimehorrorfilmfestival.co.uk. More info will be posted here when it's available. Dane Andrew & Rascal "The World's Ugliest Dog" were flown to NBC NY to the do national TV show, "The Jane Pauley Show" which will air Fri. Feb, 11th 2005. Go to janepauley.com for your local air times and channels. Dane & Rascal are the featured guests on segment 6 towards the end of the show, and talk about the Ugly Dog dynasty and of course talk about and show a clip from Tele-Zombie with Rascal. The show shot next to the SNL show and Rascal was even sighted by its guest host, Paris Hilton. TELE-ZOMBIE has been selected for this year's Shockerfest, in Modesto, CA. 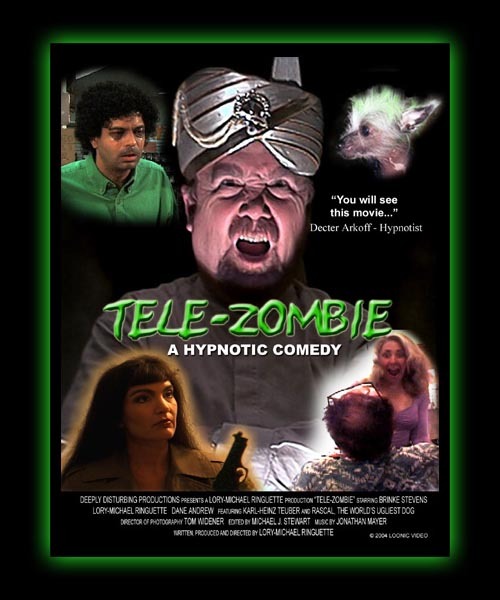 TELE-ZOMBIE will show on Saturday, Sept. 25 at the Modesto Center Plaza on "K" st. between 9th & 10th. It will be shown at 12:00 pm (noon) in the Arbor Theater. Lory-Michael Ringuette recently shot two segments with the San Francisco cable show CARTOONLAND PRESENTS, appearing as his TELE-ZOMBIE character Decter Arkoff. Airdates will be posted here as soon as they are available. Dane Andrew and Rascal recently made an appearance as guests on NBC's Morning show on KNTV-11/NBC-3, to talk about Rascal's world title as the Ugliest Dog, as well as to promote TELE-ZOMBIE. This was the first time the world has seen the new TELE-ZOMBIE poster. The NBC morning show was broadcast live in San Francisco at the opening day of the new Stienhart Aquarium. The next morning, The Today show featured an earlier interview with Dane and Rascal, which went out into National audiences in the US and parts of Canada. If this was not enough, that evening the KNTV-11 news crew aired a 3rd interview with the dynamic duo, that aired that night, and repeated in the early morning hours. Keep an eye out in the near future, because TELE-ZOMBIE may be making its World debut in a city near you! TELE-ZOMBIE is a tribute to the low-budget, independent horror/comedies of the 50's & 60's created by such producers as Roger Corman. It also touches on other pop culture including TV commercials and cartoons, such as Bugs Bunny, & Scooby Doo. Decter Arkoff, a once well-respected Las Vegas hypnotist, now works as the night man at a strange video store, where he plots his revenge on those he holds responsible for destroying his career. After finding the perfect nerd, he uses hypno-tapes & a special green soda, to turn the shmoe into his zombie slave. One by one his victims are eliminated by some of the most off-the-wall methods imaginable until something goes terribly wrong with his fiendish plan & the hunter becomes the hunted.